‘Little islands are all large prisons’, claimed 19th-century adventurer, Sir Richard Burton. He was talking, of course, about Britain. For hundreds of years British explorers have left our shores to seek new adventure in otherwise hostile places; be it on Arctic expeditions, or trudging through sweltering deserts, encountering ancient cultures and experiences absent from our comfortable little islands. They have often been ex-servicemen; soldiers, restless misfits hankering for a challenge - inspired by the stories told by those before them, like Sir Francis Drake or Burton himself. Style is, and perhaps has always been, important for the explorer. It follows their experiences with uniform in a regimented military career - the requirement to shine shoes, dust jackets, stand up straight and be on parade. And then there is the technical side. The smartest explorers think carefully about which materials are best suited to the environment into which they will be going. This is why some of the most utilitarian items in menswear are based on military clothing – including of course, the trench-coat and parka; with faithfully-constructed examples by brands like Private White VC or Grenfell. With the launch of British-made adventure-outfitter Shackleton on The Rake, we are celebrating the men who sought to go further; testing their endurance against odds that most of us could hardly fathom; bringing home stories about people and places that have given a certain romance to travel and to the lives of the explorers themselves. How many historical figures can claim to have a clothing brand – and a beer – inspired by them almost a hundred years after their death? Knighted for his achievements during the Heroic Age of Antarctic Exploration, which included not one, but two polar records and a reputation for being a resourceful hero – the Irishman was voted eleventh in a BBC poll of the 100 Greatest Britons. Rightly so, as Sir Shackleton had leadership skills of mythical proportions. He also looked the part, too; like in these photographs of him wearing chunky knitwear and a fitted parka jacket. Shackleton, the brand, has worked hard to produce clothing worthy of the great man’s motto ‘Fortitudine vincimus’ – By Endurance We Conquer. Explorers like Scott Sears, Lou Rudd and Aldo Kane agree, bringing Shackleton gear on expeditions in the DRC, the South Pole and Greenland. It's tested by the best in the worst of conditions, so it'll tackle any adventure you have in store. Click here to shop the entire collection now. Somewhere in the Antarctic - right at this moment - Captain Lou Rudd MBE is suffering through the harsh cold and loneliness of the Great White South. Following in the footsteps of Sir Ernest Shackleton himself, he is hoping to become the first person in history to complete a solo crossing of Antarctica, unsupported and unassisted. That’s approximately 70 days covering a distance of 1,500km. 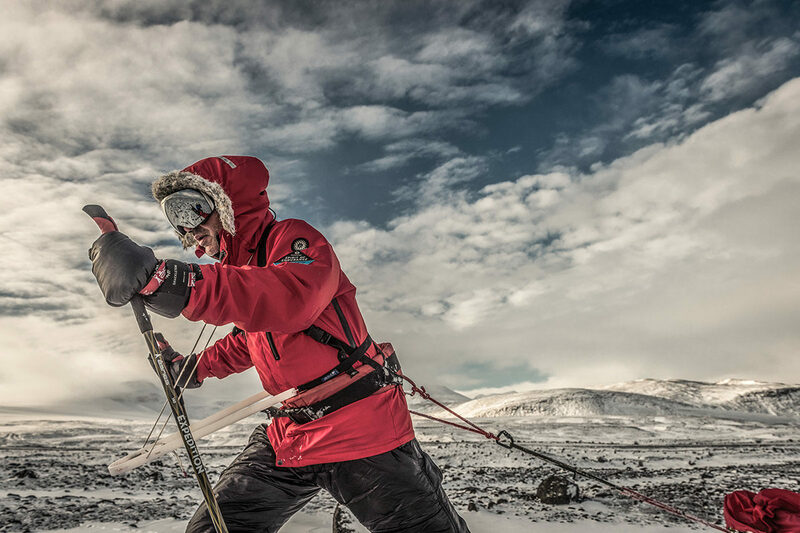 Like all record-breaking adventurers, he will be using the highest quality equipment, supplied, aptly, by Shackleton, including their parkas (which endure cold survival performance to minus 30 degrees) and performance t-shirts. While there won’t be another soul around to see him (maybe the odd penguin here and there?) he will at least be doing it in style, all while raising money for the Royal Foundation’s ‘Heads Together’ charity which aims to raise awareness and provide support for sufferers of mental health, specifically former-servicemen and women. On the importance of clothing, he tells The Rake: ‘Getting layering right is super critical… I love my Shackleton signature sweater, and got great use out of it during The Spirit of Endurance expedition’. Major Wood follows a tradition of storytelling globetrotters like his heroes T.E. Lawrence and Burton. Since leaving the military, Wood has produced documentaries covering his long walks - most famously that of the River Nile from source to delta – while writing books on the Himalayas, and, more recently, the Arabian Peninsula. Ruggedly handsome, he is not only a charming representative of Britain abroad, but also a champion of good taste, carrying his equipment in Bennett Winch bags during trips. When asked for his best clothing tip for long expeditions, he replied, ‘always pack a linen shirt. You’ll never know when it might come in handy’. True enough (as Mr Wood can attest to) one moment could see you sweating up the Caucasus and the next invited to attend a family wedding in a nearby village. Any self-respecting guest would at least make some effort. A real man’s man if there was one. No nonsense, taskmaster Fiennes - whose brother, Ralph plays the sharply suited M in the James Bond films – boasts several endurance records, a seasoned military career and a life enlivened by various scrapes and escapades. Fiennes is the type of man many of us wish we were, seemingly in tune with his fears – having completed an ascent of Everest at the age of sixty-five – and with an energy that shows no sign of slowing. He looks the part, too. 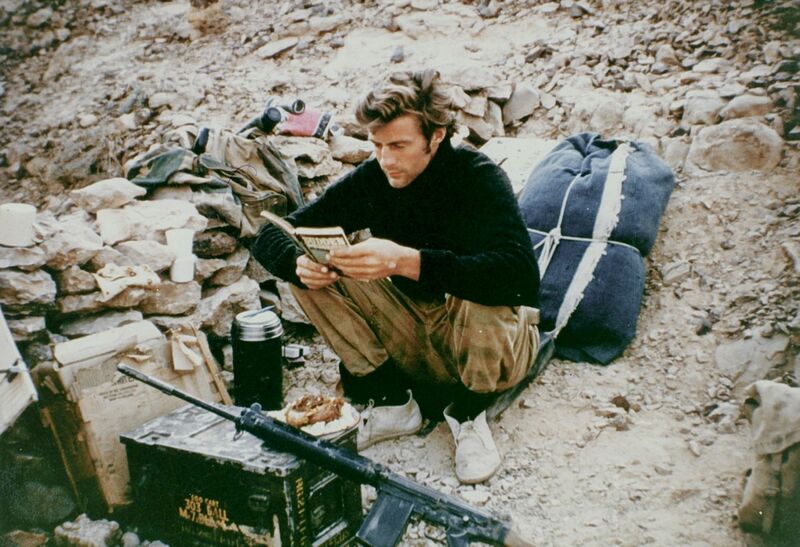 Take this photograph of him reading in Oman during his time with the SAS. Wearing dark knitwear (like those made by Shackleton in Britain), beige trousers and dusty desert boots – he looks both heroic and ready. There are plenty of photographs from during the first World War where T.E. Lawrence is wearing his tribal Arab garb; staring into the camera lens with an intense smoulder and attitude - more Hollywood than His Majesty’s Service. But something is even more striking about these photographs from 1928. Presumably on a day off from adventuring, the archaeologist, soldier, and writer wears dark tones – an oversized t-shirt with the sleeves rolled up, charcoal wool trousers and a pair of black Oxfords. It all looks incredibly mysterious, but modern too. Like a promotional shot for an indie musician; or a ‘bad boy’ actor (á la Ryan Gosling or James Dean). Lawrence was deeply troubled after his involvement in the Arab Revolt of 1916 (described in his book, ‘The Seven Pillars of Wisdom’). Nonetheless, he understood the value of style, integrity, and self-confidence.